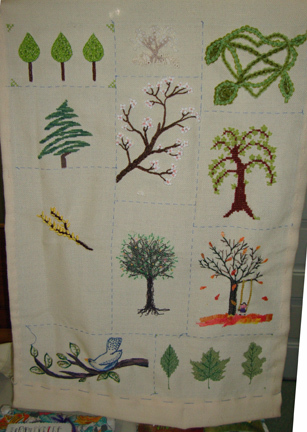 Yesterday was the grand reveal for the round robin programme at the Quinte Needle Arts Guild. This was a voluntary programme that ran from September, 2012, until yesterday. 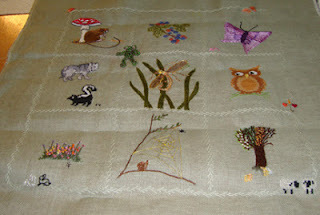 Ten members took part in the Surface Stitching Group. At the beginning, we were each given a bag, a little notebook, and a pen. 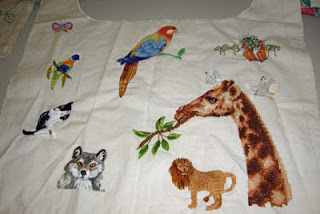 The bag was for transporting each project, and had a tag stating to whom it should be given each month. The notebook was for the project owner to record what she envisioned for her project. 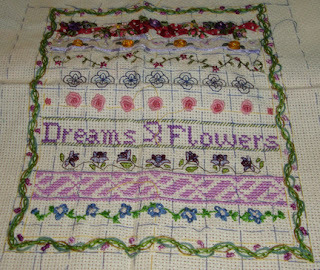 My project was called a “Stitcher’s Garden”, and participants were asked to stitch flowers on small pieces of wool felt. 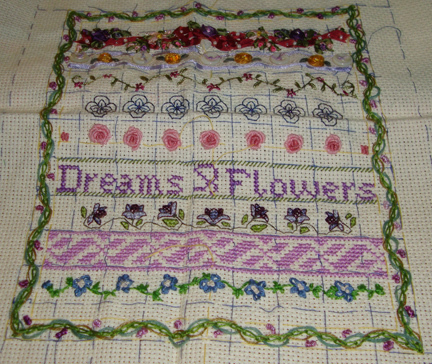 As participants added to the round robin project, they each added a note in the book about what they had stitched. This was a fun, and often challenging, project. Since September, I have stitched a rabbit, ducklings, a bamboo branch, an angel fish, a pansy, and a dragonfly; I have needle-felted flowers, and done designs in silk ribbon. We were all looking forward to seeing the completed projects. We had stitched on several pictures, pillows, a bag, and my pieces of wool. During the summer, we will finish off the projects, and get them ready for a final viewing at our September, 2013, meeting. 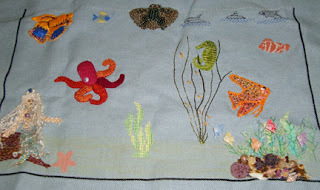 This was a great way to draw a person out of her comfort zone, and to explore stitching in a group project. What wonderful looking stitching and projects everyone did in the round robin project!